Caption slip reads: "Photographer: Gaze. Date: 1955-04-29. Reporter: Gaze. Assignment: Billy Chapin Contract. 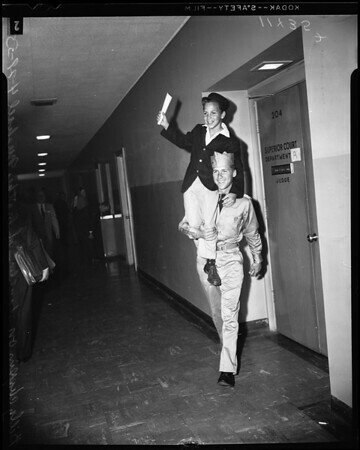 #1-2: Billy Chapin, 11, on the shoulders of his brother, Michael, 19, former western pictures actor, and now an army private waves contract with talent agency as he leaves Santa Monica superior court where contract was approved. Billy has appeared in many pictures, his first role being at the age of 22 days when he acted as the daughter of Gary Cooper. #29-30: Billy Chapin, 11, left, and his brother, Michael, 19, U.S. Army private, salute each other after Billy leaves Santa Monica superior court following approval of a talent agency contract."